An avid knitter for over 10 years, Donna enjoys sharing her free patterns and knitting experience with other fiber fans and yarn lovers. These colorful accessories will add cheer and a bit of fun to any room or occasion. 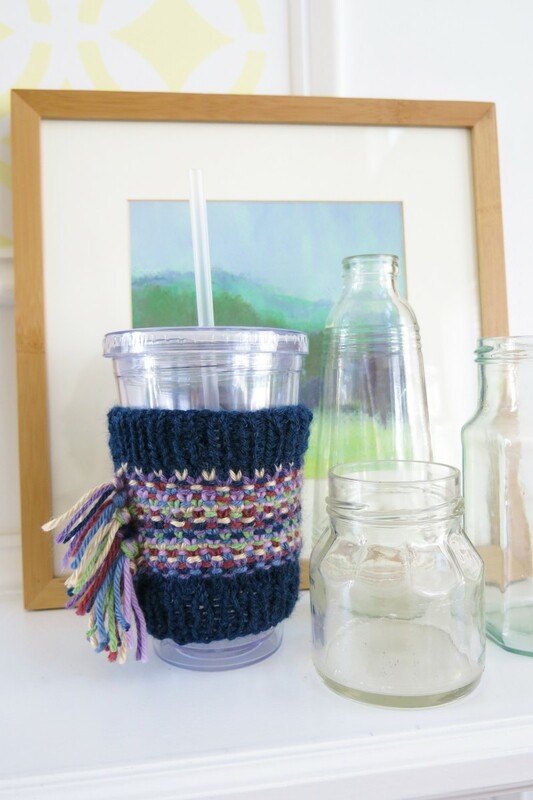 Great for stash-busting, both patterns are included below. These patterns feature a playful fringe that holds the side seams of these items together, resulting in little finishing at the end. The Confetti Fringe Pillow Cover pattern is listed first. It is a bigger project, but makes a great impact. 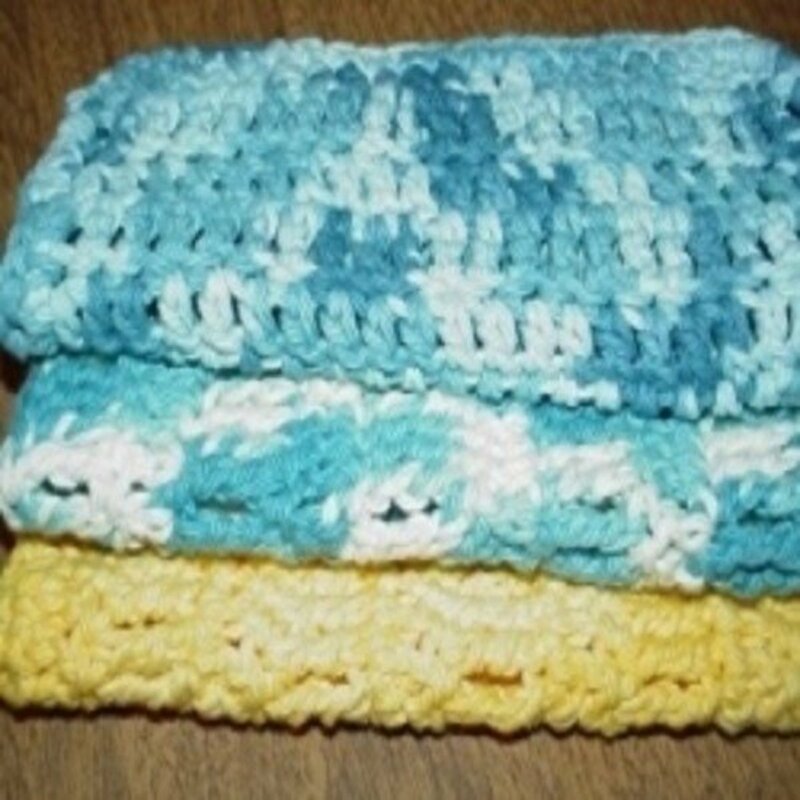 The cup cozy pattern can be found at the bottom of this page. It is a quick project and would make a wonderful gift for a birthday or stocking stuffer at the holidays. Yarn - I used a variety of leftover yarn in worsted weight. The amounts varied depending on how much I had of each color. I would estimate that I used between 200- 300 yards total for this project. 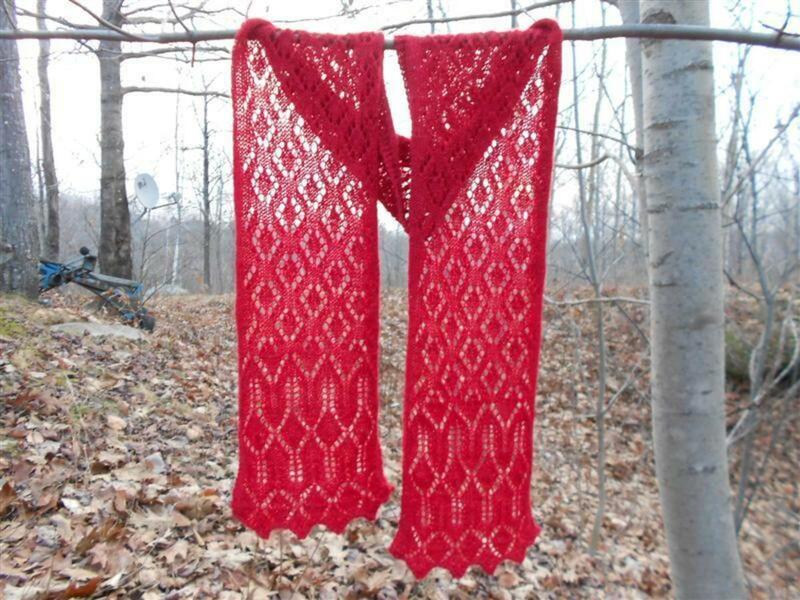 I used mainly of Red Heart Super Saver yarn, with some Caron Simply Soft and other yarns mixed in. 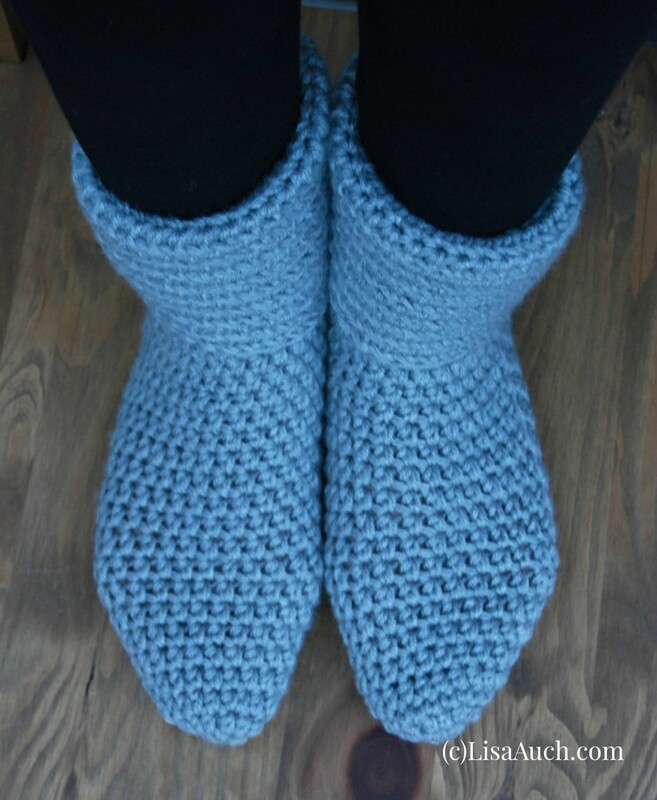 As I said, I used a lot of leftover yarn that I had, but you can do this pattern in as few as three colors. 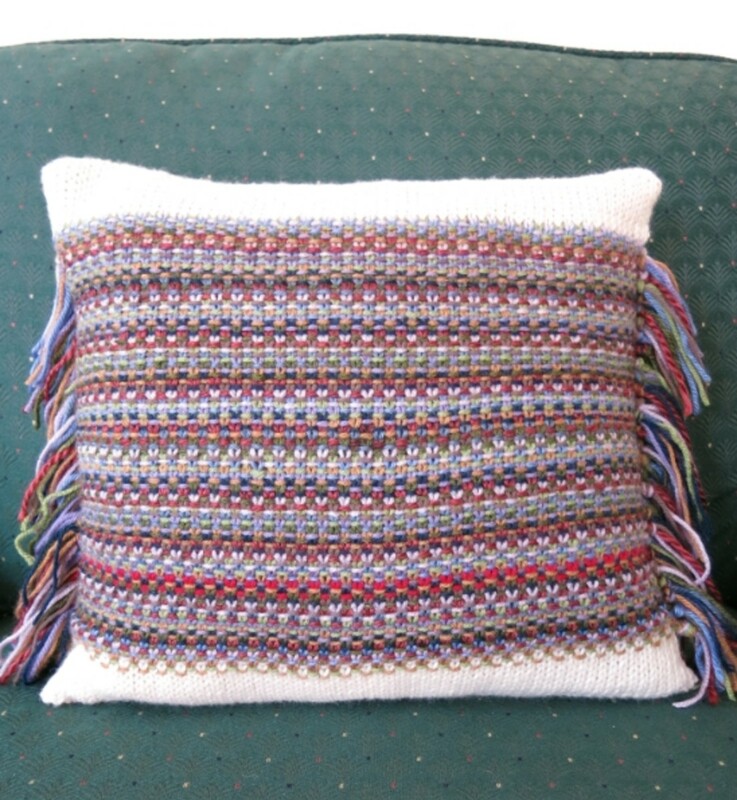 You could knit this pillow cover in different shades of one color on the front, and different shades of another color on the back with the fringe tying the two colors together. Or for a sophisticated ombré look, start with three dark shades of one color and progress through to lighter shades of the same color as you knit to the top of the pillow. Cast on 130 stitches with base color using a provisional cast on. The provisional cast on will allow you to graft or bind your top and bottom seams together when your pillow cover is complete. If you do not like the provisional cast on, you can use your favorite cast on and close your pillow using another seaming method, like a back stitch. Place marker (referred to as Marker A) and join for knitting in the round. Knit 65 stitches in Stst, place second marker (Marker B), knit rest of round. Knit 9 more rounds (total of 10 rounds). Your work should measure 2 inches from cast on edge. Then start Design Pattern. Round 1: Starting a new color and leaving a 5 inch tail, *k1, yf, sl1, yb*, repeat between * to* until 1 stitch before Marker B, k1, then cut yarn leaving a 5 in tail. You may want to leave a longer yarn tail to make knotting your tassels easier. Your ends do not need to be exactly the same length, you can trim them when you are done. Now using the same color yarn, join the yarn again leaving a 5 inch tail, continue round with *k1, yf, sl1, yb*, repeat between * to* until 1 stitch before end of round at Marker A, k1, then cut yarn leaving a 5 in tail. Round 2: With a new color and leaving a 5 inch tail, *yf, sl1, yb, k1* repeat between * to* until 1 stitch before Marker B, yf, sl1, yb, then cut yarn leaving a 5 in tail. Continuing with the same color yarn, join the yarn again leaving a 5 inch tail and *yf, sl1, yb, k1* repeat between * to* until 1 stitch before Marker A, yf, sl1, yb, then cut yarn leaving a 5 in tail. Repeat Rounds 1 and 2 for Confetti Pattern, changing colors with every round as you choose. After you finish every third round of the pattern, at Marker A, take your 6 loose ends (3 from the beginning of each round, and 3 from the end of each round) and bring them to the front of your work. Pull these ends snug so your stitches stay tight. Wrap the strands around your finger to form a loop, and pull your ends through the loop. Then slide the knot so it is tight again your knitting to form a tassel. This might take a little patience at first, but gets easier as you go along. Then on your fourth round, when you reach Marker B, do the same thing. Take the 6 ends from the previous three rounds and knot them to create a tassel. Continue repeating Rounds 1 and 2 and making your tassels until your piece measures 14 inches from cast on edge or until desired size, ending as you have just tied a tassel. Then reattach base color and do one more round of design pattern (either Round 1 or 2 depending on where you are in the pattern). Knit 9 more rounds in Stst with base color or until piece measures 16 inches. Do not cut your yarn. Weave in any loose ends from your cast on or change of colors. If you need or want to block your pillow cover to size, now is the best time to do it. Leaving your knitting on your needles and your yarn attached, pin your pillow cover down to a blocking mat. Place your pins along the top and bottom edges, and the fringe seams to shape your piece. Then spray with cool water, being careful not to wet your fringe pieces. Let dry completely. 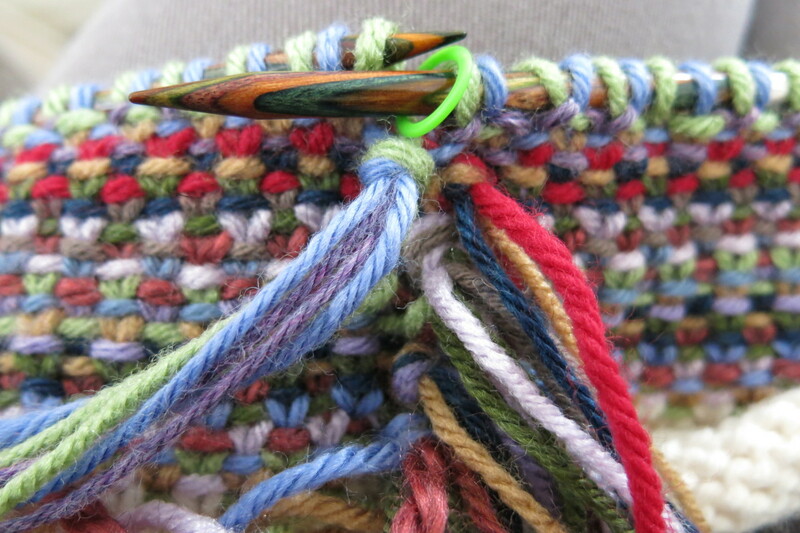 Working from the front side of your work, use the kitchener stitch to graft your stitches. This will create an invisible seam on your pillow. When done, be sure to tuck your end inside your pillow cover. Or knit one more round in Stst. 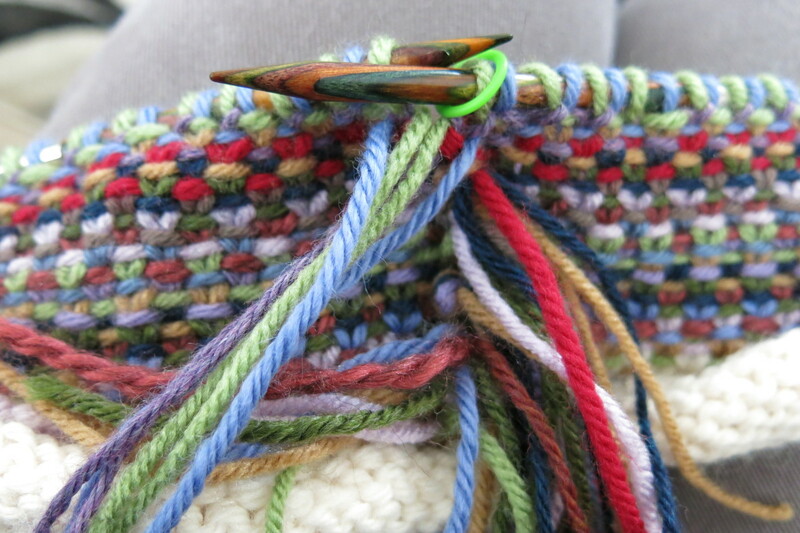 Then turning your piece inside out and working from the wrong side, you can use a three-needle bind off. This will create a visible, but clean straight seam on the right side of your pillow. Or with your pillow turned inside out, you can use a sewing seaming method, like the back stitch. Or you can continue to knit just the front side of your pillow cover to create a flap with button holes, then attach buttons to the back side of your pillow. This button flap will allow you to remove you pillow insert if you wish to change pillow covers. 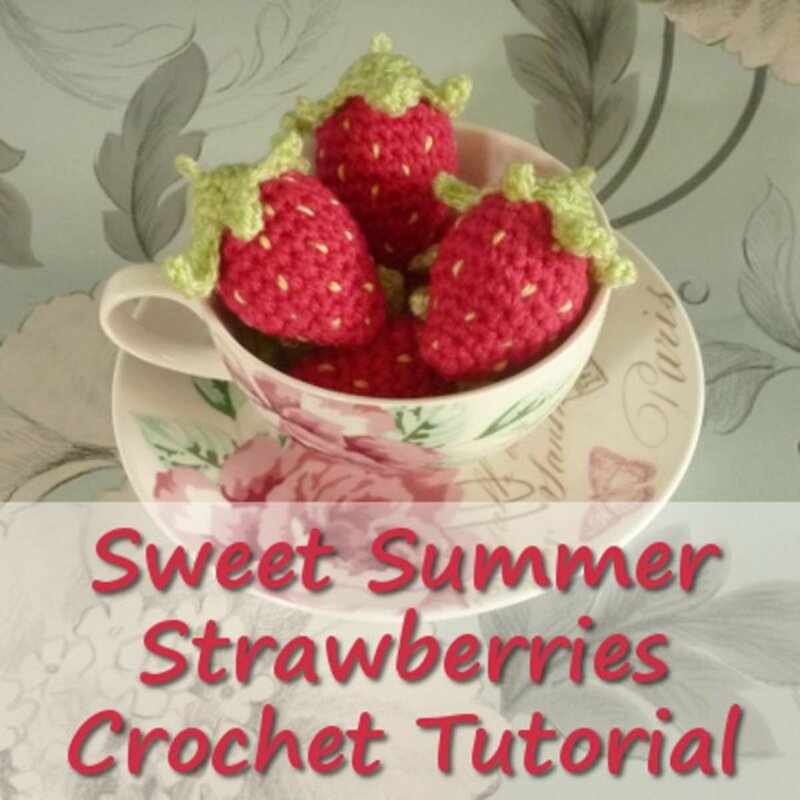 You can find video tutorials for these techniques on knittinghelp.com. First, place your pillow insert inside your Confetti Fringe Pillow Cover. Make sure your tassels lie straight along the sides of the pillow. Be sure the corners of your insert are fitting all the way into the top corners of your pillow cover. Once your Confetti Pillow Cover is smooth against your insert, you can seam your bottom edge. If you used a provisional cast on, you can unzip your cast on stitches and use the kitchener to graft your stitches together. When done, tuck your end inside your pillow cover. If you used another type of cast on, you will probably need to use a sewing stitch, like the whip stitch or overcast stitch to close the seam. Work neatly to make a clean seam. Then use the needle to drag your yarn inside your pillow cover to hide the end. Once your pillow is stuffed and seamed, lay it flat. Using sharp scissors, trim your fringe so it is all the same length, however long you desire. The Confetti Fringe Cup Cozy pattern uses the same design pattern as the pillow cover, but has only one tassel seam. This pattern is sized for a cup with a 10 inch diameter, like a large cup from your favorite coffee shop, but can be easily resized. For this pattern, I used dk weight yarn so my needle size and gauge is different from the pattern above. Yarn - I used a variety of scrap yarn in dk weight. The amounts varied depending on how much I had of each color. 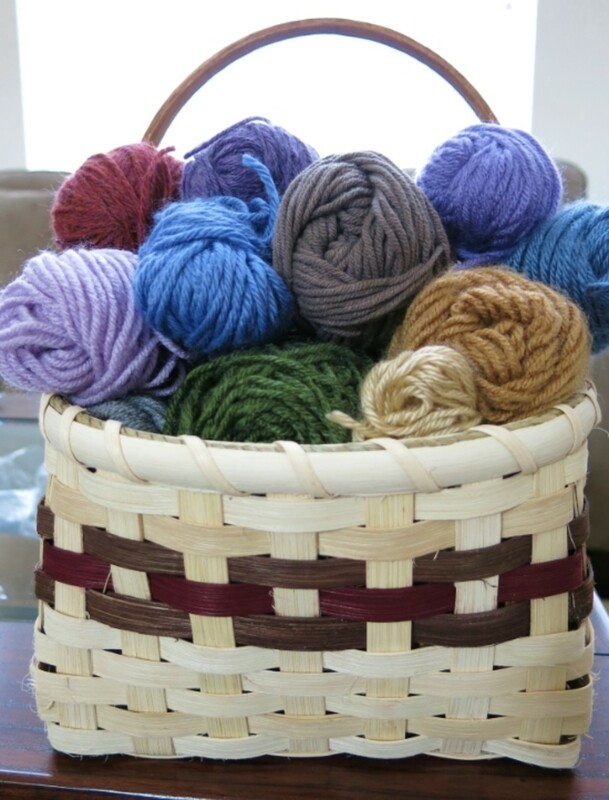 Depending on how many colors you want to use, you can use up lots of little bits of yarn in this pattern. Cast on 40 stitches with base color on smaller size dpns, place marker, and join for knitting in the round. Knit 6 rounds of k1,p1 ribbing. Next round, switch to larger needle and knit in Stst, increasing 11 stitches during round (total 51 stitches). Knit two more rounds in Stst, then start Design Pattern. Round 1: Starting a new color and leaving a 5 inch tail, *k1, yf, sl1, yb*, repeat between * to* until 1 stitch before marker, k1, then cut yarn leaving a 5 in tail. You may want to leave a longer yarn tail to make knotting your tassels easier. Your ends do not need to be exactly the same length, you can trim them when you are done. Round 2: With a new color and leaving a 5 inch tail, *yf, sl1, yb, k1* repeat between * to* until 1 stitch before marker, yf, sl1, yb, then cut yarn leaving a 5 in tail. Repeat Rounds 1 and 2 for Confetti Pattern, changing colors with every round as you choose. After you finish every third round of the pattern, at marker, take your 6 loose ends (3 from the beginning of the 3 previous rounds and 3 from end of rounds) and bring them to the front of your work. Pull these ends snug so your stitches stay tight. Wrap the strands around your finger to form a loop, and pull your ends through the loop. 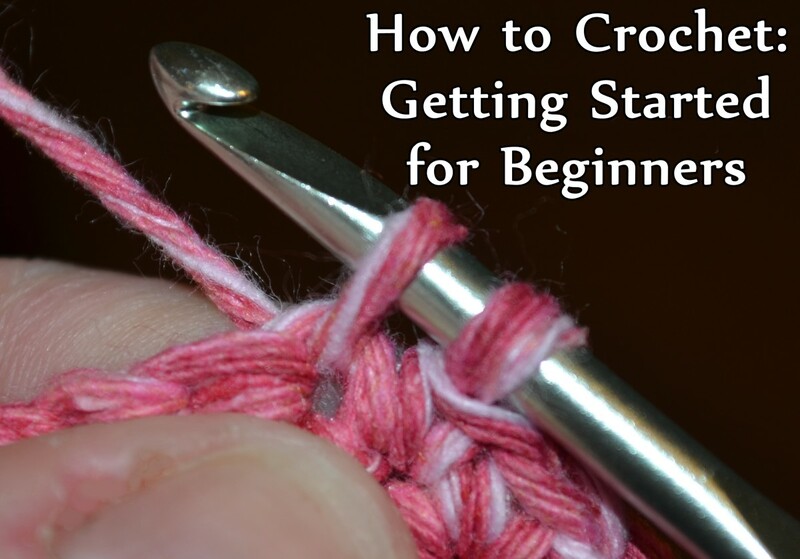 Then slide the knot so it is tight again your knitting to form a tassel (see photos above). This might take a little patience at first, but gets easier as you go. Continue repeating Rounds 1 and 2 and making your tassels until your piece measures 3 1/2 inches from cast on edge or until desired size, ending as you have just tied a tassel. Then reattach base color and do one more round of design pattern (either round 1 or 2 depending on where you are in the pattern). Knit 1 more round in Stst with base color. Next round in base color: Knit in Stst, decreasing 11 sts around for a finish total of 40 stitches. (If your cup has a wider top than bottom, you may want to decrease only 5 sts for a finish total of 46 sts). The switch back to smaller needle. Knit 5 rounds in k1, p1 ribbing. Bind off in pattern and weave in your cast on and bind off ends. Then with your Confetti Fringe Cup Cozy lying flat, with the tassels to one size, trim your fringe so it is all the same length, however long you desire. I trimmed my fringe to be about 1 inch long so it didn't get in the way of holding my cup. I didn’t bother to block this cup cozy. I just pulled on the bottom and top edges at the same time to open up the pattern. These patterns are copyrighted (©) 2016 Donna Herron. No part of these patterns may be copied or reproduced in any way without permission from the author/designer. For personal use only. These patterns and materials made from these patterns are not meant for commercial sale. Looking for more knitting ideas? 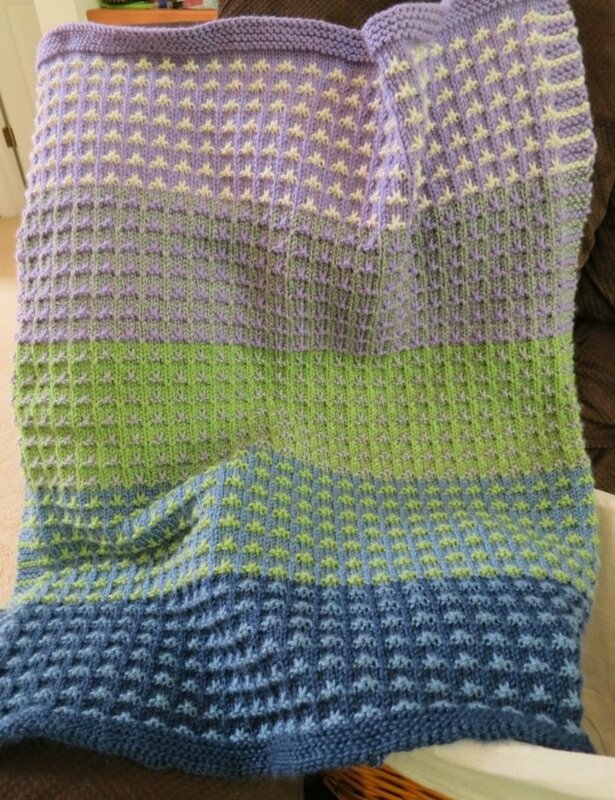 Check out my collection of FREE knitting patterns or visit my FREE knitting articles and tutorials. Thanks, Peggy! I appreciate you stopping by and commenting! Have a wonderful week!! 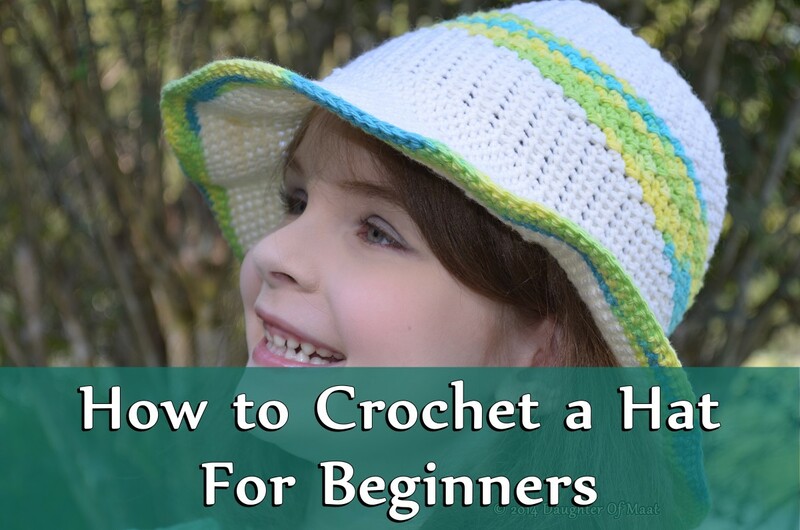 I am sure all the knitters out there will appreciate your tutorial and patterns. I gave knitting a try decades ago. 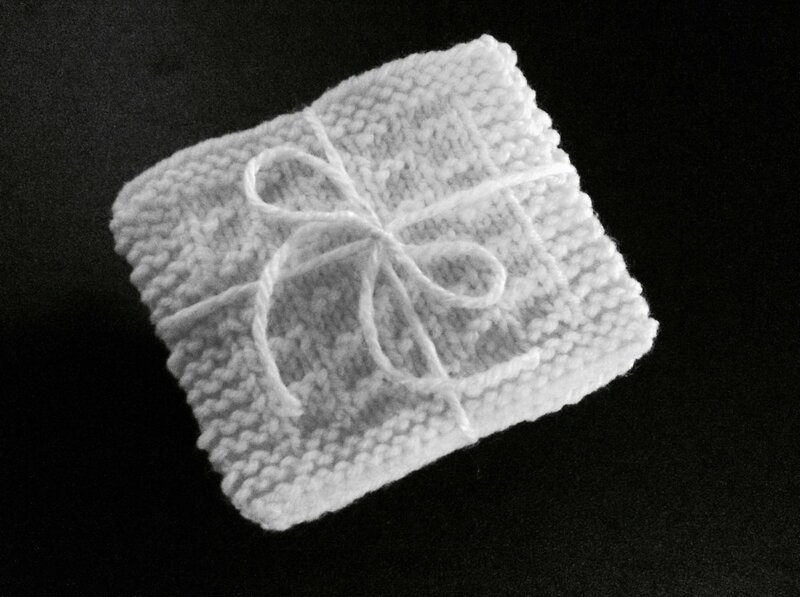 I did much more crocheting but that was also quite some time ago. I love seeing all the different things that can be made. Thanks, Rachel! I appreciate your wonderful comments and support. Best wishes to you! Thanks, Sally! You are the best!! Nice one for all those knitter out there, one of whom I am not. I can clearly see that your knitting skills are top notch and I am sure there are lots of people out there who will enjoy this one. Love the images by the way. You put a lot of thought into them.